Contact me at astronomeremily [at] gmail dot com if you’d like me to speak to your group or at an event! I’m also available for TV/radio interviews and voiceover work. I’ve given a number of presentations for the general public on a wide variety of astronomy topics – you can see a recent public lecture that I gave at the Perimeter Institute here. TVOntario’s The Agenda with Steve Paikin interviewed me for a 20-minute segment, discussing weird stars and stellar astronomy. I was featured in a short piece on NPR’s All Things Considered, talking about the book A Wrinkle in Time and its impact on me as a young science-loving kid. The interview was part of an hour-long interview for upcoming podcast The Deep. I also recorded a second interview on the book, the movie, and role models and storytelling in science for The Record on KUOW, Seattle’s local NPR station. 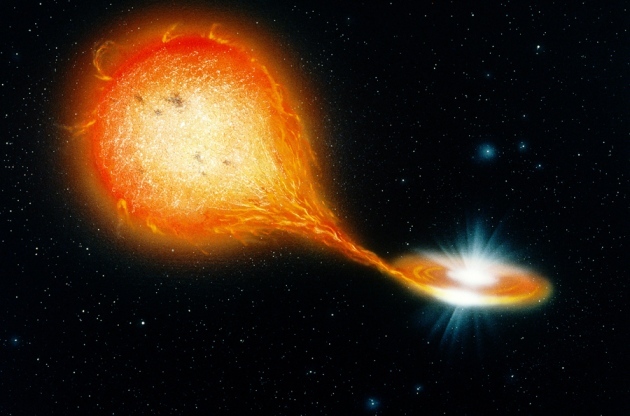 One of my group members, UW grad student Trevor Dorn-Wallenstein, discovered a low-luminosity AGN that might host two supermassive black holes in a closely-orbiting binary! Our research was featured in a press release. In 2017 I was profiled in the March edition of SAVVY, India’s leading womens’ magazine and in the November/December edition of S’more magazine, a US science magazine for young women. I was an invited inspirational speaker at the 2017 “Women Leaders in Science, Technology, and Engineering” conference hosted by the AAAS, the State Department, and the Kuwait Foundation for the Advancement of Science in Kuwait City. I co-wrote an invited article for Physics Today along with Rachel Bezanson and Grant Tremblay about the recent push for astronomy programs to eliminate the Physics GRE as part of their grad admissions process. I participated as one of several panelists at a special screening of Hidden Figures and a corresponding Q&A on equity and inclusion in STEM and media. The Chronicle of Higher Ed featured myself and several other people in an article on the varied experiences of women in astronomy. I was included in Business Insider’s 2015 list of 50 “groundbreaking scientists”, covering my research on massive stars and their role in galaxies. Forbes interview myself and several colleagues for an article on supernova impostors and transient phenomena like SN 2009ip. I’m featured in the September issue of Astronomy magazine as one of twenty astronomers interviewed for their main article on the future of astronomy. We were asked to give our thoughts on what we think the next decades will hold for our field; you can read my answer here. My collaborators and I discovered a candidate Thorne-Żytkow object in the Small Magellanic Cloud! View a press release on the discovery here, our original paper here, and listen to an interview about the discovery with the CBC’s Quirks and Quarks here. I was interviewed on KGNU‘s “How On Earth” science radio show to discuss my research on massive stars, observational astronomy, and more; you can listen to the interview here! In 2012 I was awarded the Astronomical Society of the Pacific’s Robert J. Trumpler award for “a recent Ph.D. thesis considered unusually important to astronomy”. I am featured in Mabel Armstrong’s 2008 young adult book, “Women Astronomers: Reaching for the Stars“, which features short biographies of female astronomers extending from Hypatia of Egypt and Maria Mitchell up to present-day scientists! In 2005 my collaborators and I discovered the three largest stars in the known universe. The discovery was presented at the 2005 AAS meeting and was covered by worldwide media.